Get ready for the eclipse with Lander Art Center! Join Lander Art Center for the opening of our newest exhibition! 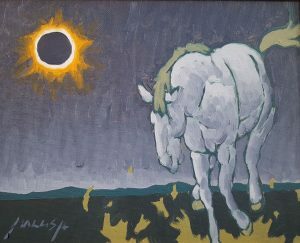 View the work of 23 artists from around the state and see how each interprets the upcoming solar eclipse through their chosen medium. Enjoy wine and appetizers and find out which pieces judges Jerry Antolik, Suki Smaglik, and Melissa Strickler voted Best in Show, 1st, 2nd, and 3rd place! Great American Eclipse 2017 will run from July 14th through August 26th. As always we would greatly appreciate donations of food for the opening.